Amazon has had some pretty great deals as part of its Free App of the Day, but apparently that's over now. The prolific retailer is replacing it with Amazon Underground, which includes "over $10,000 of apps and games that are actually free." 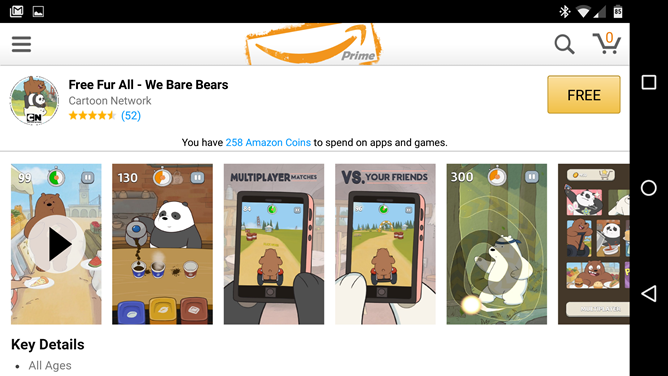 Specifically, Amazon is giving away paid apps and in-app purchases with an agreement that reimburses app developers based on the amount of time the apps are actually used. It's very much like Amazon Kindle Unlimited, without the extra charge. 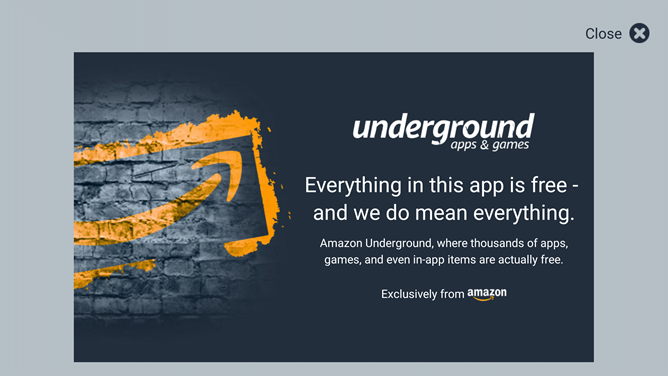 The promotion comes in the form of a brand new Amazon Underground app. This app replaces all the functionality of the standard Amazon Shopping app, with the Underground partner apps thrown in as well. And surprisingly, this isn't just a bunch of junk from developers who are desperate for a little exposure - these are premium games, well-known apps and tools, and in-app purchases that would cost considerable amounts of money on the Play Store, all available completely free to end users. Games from Rovio, Glu, Gameloft, and more are included. Not all of the in-app purchases are set to free - you can't just download an infinite amount of gems - but at least some will come at no charge. Update: see below. 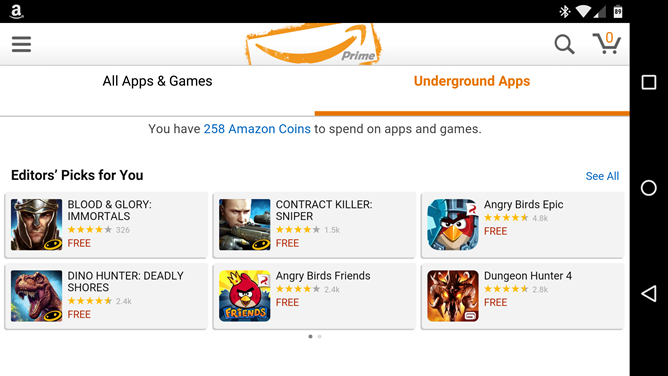 To get Amazon Underground, just open Amazon Shopping or the Amazon Appstore on your phone - it should appear as a banner right at the top of either of them, prompting you for a sideload installation just like a normal Amazon Appstore app. (You can also download it directly at amazon.com/underground.) The Shopping app will be replaced with Underground, and the Amazon Appstore app (where paid and free apps and games that aren't part of Underground are still available) will include a cross-app link. Check it out, there's a surprisingly great selection already. If Amazon is hoping to get people excited about its Appstore as an alternative to Google Play, they're off to a good start. Developers can learn more at developer.amazon.com/underground. We were told by an Amazon representative that, in fact, all apps under the Underground label that are marked "actually free" have zero in-app purchases. 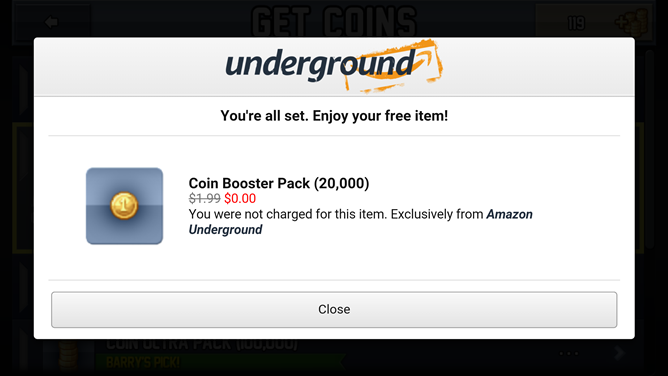 Other apps without the "actually free" label may still offer standard IAP, and those apps that take advantage of the Underground program may or may not be modified by the developer to better balance the game without the assumption of purchases built into the game's economic model. 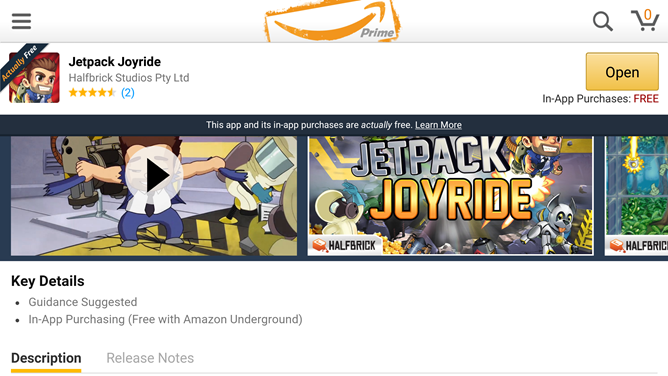 In the game that I tested, Jetpack Joyride, the IAP items I was used to seeing had all their prices marked as zero, and processing them through Amazon resulted in a "$0.00" charge to my account. Neat.